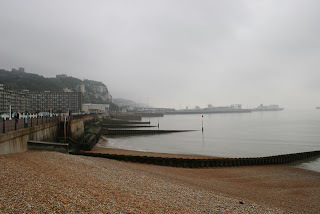 Whilst recently in the UK for work, I took the opportunity to head down to Dover one Saturday and join in a squad of swimmers training to swim the English Channel. I thought it would be a good opportunity to see how cold it really was and what sort of preparation would be required etc if I decided that I would do it in the future. The adventure began on a humorous note: I made quite a name for myself emailing a large group of these swimmers with the subject "Anyone available for a ride to Dover this Saturday?" as apparently it would appear in England that getting a ride with someone means something quite contrary to getting a lift. Anyway, after receiving a few emails from people thanking me for entertaining their day, James replied offering me a spot in his car (at least that what I hoped he was expecting!). Got home Friday night and saw James had emailed to let me know that by the way, tomorrow is a 7 hour swim, so be prepared to lose that day. Oh my god, I thought to myself, what on earth?!?! Then I decided oh well, surely I can get out when I have had enough.... I later learnt, no you cant! We headed off bright an early to Dover. Another swimmer, Tullio, picked me up on his motorbike and gave me a lift to James' and we headed down south from there. We arrived and I met the famous Freda, known as the "Channel General" whose daughter has swum the English Channel a world record 43 times. 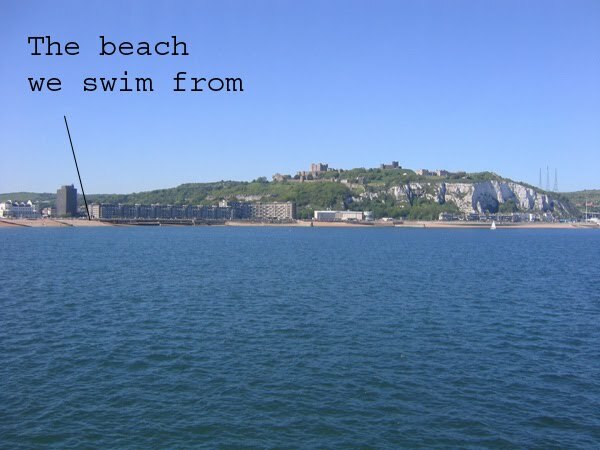 She runs the training on Saturdays and Sundays from May - September, helping swimmers achieve their dreams of swimming the English Channel. I realised pretty quickly, this is not a woman you mess around with! After filling in my disclaimer, she asked "5 or 7 hours". 'Right', I thought to myself, 'I guess that's the option, I better go with the 5'. 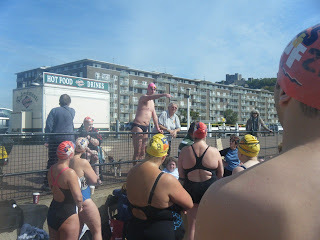 A quick group briefing for the 30 or so solo swimmers, the teams would join us in an hour. The boys asked how fast I swim, and decided I might be able to stick with them so off we went. We were all decked out speedos/sluggos (yes, no wetsuits) and red caps for soloists and yellow caps for teams. The water was measured at 14.6 degrees. Chilly to say the least! And so it began. The routine is 2 hours swimming non-stop, then we get a ' feed' and then another 3 hours with a feed every hour in that three hours. The feeds became my lifeline. It broke up the constant monotony of swimming and as I got colder it provided a much needed warm shot of energy into my body. The first feed we were handed a warm cup of energy drink and a couple of jelly beans. The Russian girl I started swimming with at this point was shivering violently she was so cold - and she was doing the 7 hours today. The second feed was the warm drink and half a banana and the third and final feed was warm drink again and a chocolate bar. Each feed lasted less than 60 seconds. It was too cold to not be moving, so off we would go to swim more laps of the bay. Feeds are staffed by a bunch of volunteers who all stand on the shore once an hour as a bunch of desperate swimmers clambour onto the rock beach and sip down the drink and food and are off again. For them its all over in 7 minutes or so and then they wait until the next hour. Thankfully the weather today was 28 degrees, so many would sunbath whilst waiting for our feeds. The course was swimming pier to pier at Dover. Approx 2.4km round trip. It was interesting to see as the time progressed and as my body got colder, how the amount of distance I covered per hour dropped. Not surprising really, I have never swum in such conditions, and never for such an extended period of time. It was quite an interesting feeling in my fifth and final hour as my body hit extreme discomfort. I was freezing. I really was in a world of pain, but I knew I was only 50 minutes from the finish and so I plugged on. And as I breathed and watched the beach, it seemed bizarre that I could be so cold and yet people were all lying in the sun sunbathing! In the last hour I only managed to swim one round trip of the bay - a good kilometer less than I started at! The feeling of relief and satisfaction as I hit the shore after 5 hours was great. 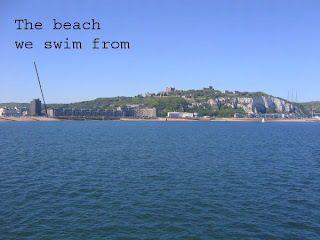 I had achieved my longest swim to date, both in time and in distance (14km) and I had done so in sub 15 degree temps. In reality though, I was so disorientated when I finished. I stumbled around for a good ten minutes, whilst those around me who had clearly done it before seemed fine. I ate 2 Mars Bars trying to refuel and get back to being able to think. Everyone was so nice and chatty and enthusiastic. The boys seemed to think it was hysterical that I was here from Sydney for work and thought it would be cool to come down and swim for 5 hours one weekend. I think it was slightly mad, but I am glad I did it and now have an inkling of the challenges ahead in distance ocean swimming. And I made some new friends who will soon be English Channel solo swimmers! 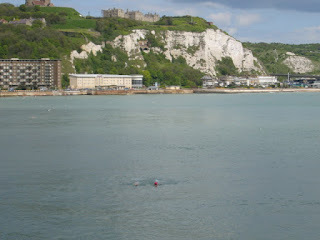 Long distance ocean swimmer and wannabe triathlete from Sydney who is currently embarking upon swimming across the English Channel in July 2012 solo.